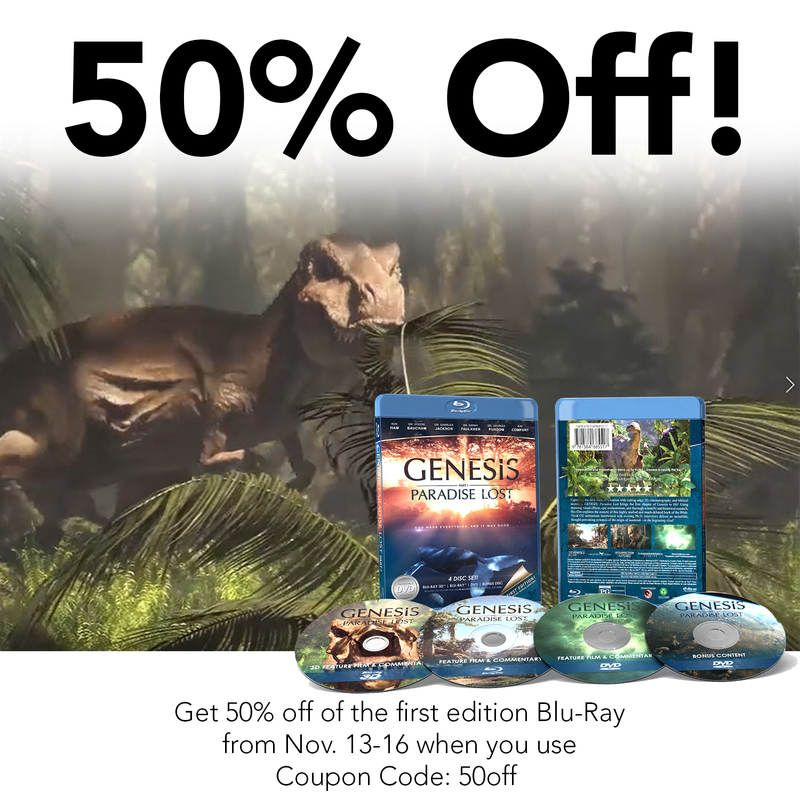 50% off “Genesis: Paradise Lost” this Week ONLY! Tell your Friends! If you know anyone who might buy this, or if you’re looking for a good Christmas present which will entertain, educate and inspire, then NOW is the time! Share this with your friends and family, and get one for the atheists you love. This is a special sale to celebrate the anniversary of this award winning film being shown in theaters- and if you haven’t been there, 20 minutes of this film are being shown in the 4D theater at the AiG Creation Museum! It depicts Creation Week like you have never seen it before! The reviews for this movie on IMDB and Fandango were AMAZING, so check those out if you are in doubt, but I personally recommend it highly, and when I saw it a year ago in a sold out theater, I ran home and wrote a glowing review. Like many of the reviews which didn’t give it a perfect 5 stars, my only complaint was about the theater itself- that the theater wasn’t showing it in 3D like they were supposed to, but the film itself is wonderful and captivating, beautiful and educational. But don’t take my word for it, check out those reviews, watch the trailers at genesismovie.com and pick up a few for Christmas gifts. It’s only a month away.